This optimized design uses 3 elements of high-index glass to widen and flatten the field while increasing the photographic speed of the 175 StarFire EDF triplet refractor from f/8 to f/6.1. It is designed to be used with a variety of cameras when matched to the appropriate adapter. 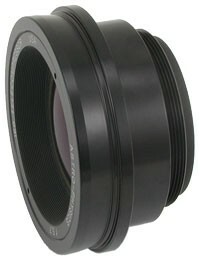 The 175EDF operating at f/6.1 (0.76x compression) is an ideal match for large format cameras. Extreme detail can be captured in very short time thanks to the fast focal ratio. This accessory is a must for H-alpha imaging where speed and resolution allows one to achieve incredible results. Wide-field images will be highly detailed, which allows the astro-imager to make very large prints without doing time-consuming mosaics. Even when enlarged to 30 inches, a single image will still have pinpoint stars across the entire frame. The distance of the back of the housing to the image plane must be within 1 mm of ideal (80.8 mm +/- 1 mm). Astro-Physics produces several adapters (listed below). These adapters, when used with their respective cameras, provide perfect spacing. Please review the document "0.76x CCD Telecompressor Corrector Spacing Requirements" for more information. Adapters for other cameras can be custom ordered from PreciseParts. Important: The distance must be the OPTICAL distance - NOT the mechanical distance. Please be sure that you have accounted for the indexing effects of your filters, sensor cover slips and any other glass in the light path. A UV-IR filter must be installed in the luminance channel in order to preserve the best possible image resolution into the corners of the large formats. Without this filter, the distance will be incorrect and the luminance image will have slightly different scale factor from the RGB channels. Therefore, the various channels will not register properly. Also, the IR must be filtered out to prevent elongation in the corners of the STL format due to difference in lateral magnification of the longest wavelengths. Important: the UV-IR filter must match the other filters being used in terms of is effect on the light path. Please check with your filter manufacturer to confirm. Chip not listed? The 175TCC yields 3.221 arcminutes per mm of chip.